Organised by the group “RNA Bioinformatics and High Throughput Analysis Jena” (Prof. Dr. M. Marz), a two-day meeting entitled “Virus goes Bioinformatics” takes place on 11 and 12 October 2012. Designing living matter – Can we do better than evolution? 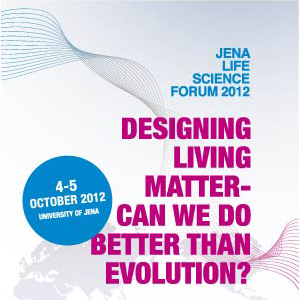 The Jena Life Science Forum (JLSF) is a scientific forum to discuss topics and issues in fundamental biological research that may be expected to shape our future. This year’s meeting will focus on recent developments in synthetic biology. Three subjects seem to be most prominent: designing biomolecules – designing cells – designing organisms. Apart from basic scientific questions sociological and political aspects of synthetic biology will also be addressed. 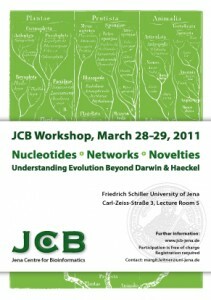 The JCB organizes the GCB 2012, which will take place from 19 – 22 September 2012 in Jena. The meeting is open to all fields of bioinformatics and theoretical systems biology. Five satellite workshops place thematic emphasis on diverse aspects of systems biology. One of the first German bioinformatics meetings bringing together computer and natural scientists took place in Jena in September 1994. Two years later, in 1996, the series of German Conferences on Bioinformatics (GCB) was started in Leipzig. 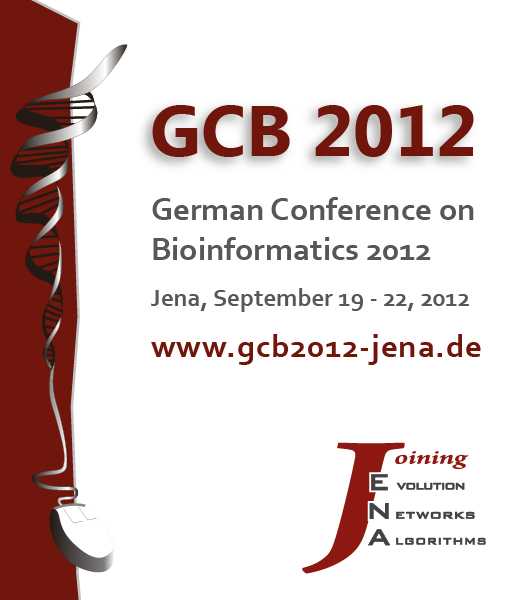 In 2012, bioinformaticians from Germany and abroad will meet again in Jena on the occasion of GCB 2012. The conference will cover all aspects of Bioinformatics and Systems Biology. It will feature a regular paper, a highlight and a poster track. Regular papers will be published in the conference proceedings. Highlights should describe recently published work to be presented to the conference participants. All contributions will be peer-reviewed. The main conference takes place from 20 – 22 September. In addition, on September 19, a number of pre-conference workshops will be organized. These will include the topics Systems Biology of Aging, Organ-oriented Systems Biology, Network Reconstruction and Analysis in Systems Biology, Image-based Systems Biology and Computational Proteomics and Metabolomics. The Workshop will be the 9th in a series of annual International Workshops on Systems Biology held in Jena and organised by the Leibniz Institute for Natural Product Research and Infection Biology – Hans Knoell Institute Jena. In 2011, the workshop will have its focus on data and knowledge based modelling and model-driven analysis of microbial infection processes. Organization: The workshop is organised by PD Dr Reinhard Guthke and Prof Dr Thilo Figge from the Systems Biology Groups of the Leibniz Institute for Natural Product Research and Infection Biology – Hans Knoell Institute together with BioControl Jena GmbH. Nucleotides – Networks – Novelties.